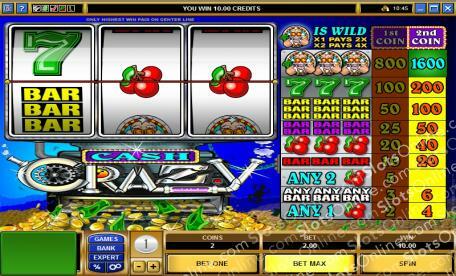 You’re going to go crazy for this fantastic slot game, as it will see you spinning the reels to spin in crazy amounts of cash! Click here to play! While there are plenty of symbols in this game that will help you bring in big wins, you’ll want to be sure to line up as many cash crazy men as possible as this grinning guy holds the top payout that this game has to offer. Spin in three across the single payline and you’ll get up to 1600 coins. He is also a wild and will not only replace all other symbols to help you bring in more wins, but he will multiply your winnings if he appears in a winning line. Don’t forget the lucky sevens. Three of these numerical symbols will get up to 200 coins. There also are triple, double and single bars to bring in the wins as well as cherries to help you amass your crazy cash fortune. This classic 3 reel game accepts a max of two coins with adjustable values. Be sure to bet max in order to activate the highest pay table. Spin these reels to go cash crazy and bring in plenty of big money wins. The Cash Crazy man is a substitute. He will replace all other symbols to create more wins. He will also multiply your winnings by 2 if one symbol appears in a line and by 4 if two symbols appear in a winning line.